Indore-Manmad railway line: Jawaharlal Nehru Port Trust- Ministry of Shipping, Ministry of Railways, Government of Maharashtra and Government of Madhya Pradesh on Tuesday signed a MoU for implementation of the 362 km Indore- Manmad New Railway Line Project. 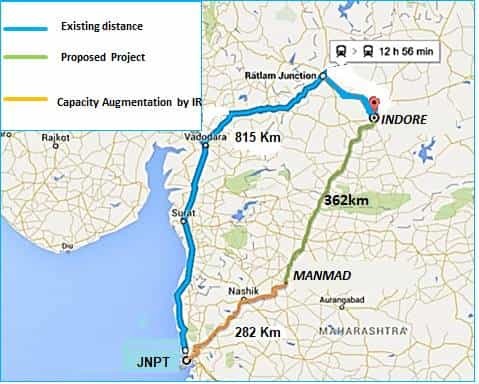 Indore-Manmad railway line: Jawaharlal Nehru Port Trust- Ministry of Shipping, Ministry of Railways, Government of Maharashtra and Government of Madhya Pradesh on Tuesday signed a MoU for implementation of the 362 km Indore- Manmad New Railway Line Project. Speaking on the occasion of the signing of the MoU, Union Minister Nitin Gadkari said this was a major step towards the development of backward areas of Madhya Pradesh and Maharashtra through which the new railway line will pass. The Indore-Manmad rail line will be constructed under Narendra Modi government's ambitious Sagarmala project. According to an official statement of the Ministry of Shipping, "Containers and other rail traffic from Indore and other Central Indian locations earlier had to follow a circuitous route through Vadodara and Surat to reach Mumbai, Pune and ports like JNPT, travelling a distance of 815 km. The new project will reduce the distance from Mumbai/Pune to key central India locations by 171 kilometres, resulting in lower logistics costs." "This is especially significant as the new railway line will pass through the Delhi-Mumbai Industrial Corridor nodes of Igatpuri, Nashik and Sinnar; Pune and Khed; and Dhule and Nardana," it added. Indian Port Rail Corporation Limited (IPRCL) will implement the project on Joint Venture SPV model. For this, a Joint Venture Company will be formed between Ministry of Shipping or its nominated PSUs/Entity including JNPT (which will be the main promoter) with equity share of 55 per cent, Government of Maharashtra or its nominated PSUs/Entity, Government of Madhya Pradesh or its nominated PSUs/Entity, and others with equity share of 15 per cent each. It is estimated that the project would result in cumulative net economic benefits of Rs 15,000 crore in the first 10 years of operations. According to Gadkari, the logistics advantages of the project include providing a shorter route for the passenger as well as the freight traffic originating from/ terminating at or crossing through the region. The Union minister further said, "project will help in employment generation, reduction in pollution, fuel consumption and vehicle operating costs." Indore-Manmad railway line project will be constructed within six years.